Did you register as an Employer or have employees in 2011? If the answer is yes, you or your company is due to file a P35 Return for the tax year ended 31 December 2011 and pay any potential liability by the 15th of February 2012. What if you don’t file and pay on time? Employers who fail to submit a completed P35 return by the above date will be liable to penalties of up to €4,000 and you may also risk a possible tax audit. Please note the information on you Form P35 Return is of crucial importance, especially in protecting the social welfare entitlements of your employess. In the absence of that information, your employess may be unable to claim their benefits if applicable. I had no employees but I registered – Do I have to do anything? If you had no employees in the period you should sign a declaration and return it to the Collector General. I pay my PAYE taxes monthly by Direct Debit – any action required? Yes, you must still file a P35 to ensure the monthly direct debit amounts were sufficient to cover the actual liability for the tax year. We suggest in light of the new tax rates imposed by Budget 2012 that you review now the amount that you are paying to ensure that sufficient tax will be paid each month for 2012 to avoid an underpayment at the end of the year. The monthly payment should be reviewed now to check if your direct debit amount is sufficient. Is there an extended P35 tax deadline? 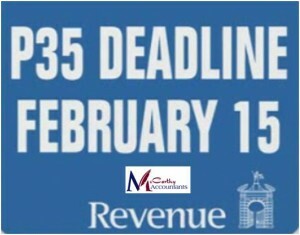 If you file your return AND pay online through the Revenue Online Service you can avail of the extended deadline of the 23rd of February 2012. Remember avoid penalties, a possible audit or even criminal prosecution by filing on time. What methods are available to submit P35 returns? How can I register for ROS? What must I enclose when returning my P35 to your office? What details do I return on the P35LF? Do I need to complete the new P35 LF for each employee? Should I return the P35 LF if it doesn’t apply to me? Does my computer payroll need to be ROS compatible to file my P35 on ROS? Can I file my P35 on Disk? Are employers required to enter the amount of medical insurance contributions paid for each employee on the P35L/P35L/T? If no medical contributions have been made for the employees should I leave the fields on the P35L/P35L/T forms blank? How can management payroll be processed separately from staff details on the P35? Can I photocopy the P35 Declaration, P35 LF’s P35L’s and P35L/T’s in order to complete my return? Do I include Directors on my P35? If I had a family member working for me during the year do I include him/her on the P35? If I had no employees during the tax year am I still obliged to file a P35 return? If I had no employees during the tax year and will not have any employees in the future how do I cancel my employer registration? If an employee left during the tax year must I include him/her on my P35? Where do I get P60’s for issue to my employees? Where do I get ROS and paper P45’s? If an employee left before the end of the tax year should I give him/her a P60? If an employee commenced with me during the tax year do I include PAYE/PRSI details from his previous employment on my P35? If an employee was with me for two separate periods or more during the tax year do I make two separate entries on the P35 or do I combine the two details into one entry? If I have an employee with a PPS (formerly RSI number) who is not listed on the P35L what do I do? If I hold a PAYE exclusion order certificate for an employee do I include him/her on my P35? When returning my P35 to your office do I enclose copies of the completed P60’s? When returning my P35 to your office do I enclose my completed Tax Deduction Cards? I am on a Direct Debit for PAYE and PRSI and have an overpayment at the end of the tax year. How do I claim back this overpayment? If an employee had more than two classes of PRSI during the tax year where do I show the extra classes? If I forward a cheque before the due date without the P35 will I avoid the penalty for late return? What is “Gross Pay”/‘‘Net Pay’’? If I made a mistake on my original P35, which has already been submitted to your office, how can I rectify that mistake now? If my Employer Number changed during the tax year what should I do? If I did not receive a Tax Deduction Card for one of my employees, how can I obtain one? How do I join the Direct Debit scheme/change my monthly Direct Debit? If my P35 is ready for submission but I don’t have the outstanding balance to send with it, should I hold onto the return until I have the money and then send both of them together? If I require further P35/P60 stationery who should I contact? If I wish to change my mailing address whom should I contact? If I take on an employee without a PPS No.who should he/she contact? 1. What methods are available to submit P35 returns? Revenue On-Line Service: ROS provides the facility to securely file the P35 Return on-line and to pay any balance due on-line by laser or ROS debit instruction. The P35 Return can be filed via ROS if a ROS compatible computerised payroll or a manual payroll is used. ROS customers receive instant acknowledgment of returns and have on-line access to tax information 24 hours a day. P30 payments can also be made electronically via ROS. Paper Return: If a manual payroll is used a paper return consisting of an original P35 Declaration original P35L(s) P35 LF'(s) and P35L/T(s) should be submitted. 2. How can I register for ROS? ROS has a simple three-step registration process. From the Revenue homepage Click “Register for ROS” and follow the three step process. You will be issued with a Digital Certificate when you have completed the three steps. Your Digital Certificate enables you to access ROS and utilise its full range of services. It is advisable to register well in advance of the due date for the filing of the P35 i.e. 15 February. The process to register for ROS takes about 8 working days. 3. What must I enclose when I am returning my P35 to your office? P35L: Details of employees with PPS numbers. P35L/T: Details for employees for whom the PPS number is not known. The full name, private address, date of birth and mother’s surname at birth must be provided in respect of these employees. 4. What details do I return on the P35LF? Parking Levy (if applicable). The total number of employees contributing to parking Levy by way of deduction through payroll during the year and the total amounts contributed by the employees. Taxable Benefits. Total Benefit in Kind for all employees. 5. Do I need to complete a P35LF for each employee? No. The total amount only is required on the P35LF. 6. Should I submit the P35LF if it doesn’t apply to me? No. There is no need to return the blank form. 7. Does my computer payroll need to be ROS compatible to file my P35 on ROS? To upload the P35 Return through ROS directly from a computerised payroll the payroll must be compatible with ROS. ROS provides a specification to software payroll providers, which enables them to render their software compatible with the ROS system. Once enabled, employers and agents who have completed their return using the software, can upload it through ROS. The specification is available on the ROS homepage under System Requirements. To confirm that a payroll package includes the facility to file P35 return through ROS please contact the payroll package provider. 8. Can I file my P35 Return on disk? No. Employers who previously filed their P35 Return on disk should now file their returns on ROS. If you are not registered for ROS please see question “how can I register for ROS?” Or alternatively, select ROS on the home page. 9. Are employers required to enter the amount of medical insurance contributions paid for each employee on the P35L/P35L/T? Yes. On the P35L or P35L/T there is an additional field for medical insurance paid by the employer. The amount of premium paid by the employer to the insurance provider plus the amount paid over to Revenue i.e. tax relief at source, should be recorded for each employee. 10. If no medical contributions have been made for the employees should I leave the fields on the P35L/P35L/T forms blank? Yes. The relevant fields should be left blank. 11. How can management payroll be processed separately from staff details on the P35? Ideally, all details should be filed on the same Return. However, if necessary staff details can be filed with the Original Return and details for management filed as a Supplementary Return. Both returns should be submitted by the 15 February deadline. 12. Can I photocopy the P35 Declaration, P35 LF’s, P35L’s and P35L/T’s in order to complete my return? 13. Do I include Directors on my P35? Yes. When a company is set up, the company must register as an employer and operate PAYE/PRSI on the pay of directors even if there are no employees. A P35 must be returned giving details of pay, tax, PRSI etc. for the directors as well as any employees. 14. If I had a family member working for me during the year do I include him/her on the P35? Yes. All persons in your employment during the tax year must be included on the P35 unless you hold an exclusion order certificate. 15. If I had no employees during the tax year am I still obliged to file a P35 return? Yes. You are obliged to file a return. The P35 Declaration form should be completed indicating a zero liability (Enter “0” on the P35 Declaration) and the formal declaration must be signed. 16. If I had no employees during the tax year and will not have any employees in the future how do I cancel my employer registration? To cancel your employers registration you should send the completed form TRCN1 to your local Tax District (contact details can be found by using the ‘Contact Locator’ on the Revenue website). The form TRCN1 can be downloaded under ‘popular forms’ on the Business & Self Assessment tab at the top of the home page. 17. If an employee left during the tax year must I include him/her on my P35? Yes. All persons in employment during the tax year including those who left, even if that employee had no tax liability, must be included on the P35. 18.Where do I get P60s for issue to my employees? Revenue is no longer making P60 stationery available for employers to print P60s for their employees. Employers must print P60s on their own stationery. For the year 2010 onwards, employers must print the P60 form on their own blank stationery. A Revenue approved template of the P60 is available on the Revenue On-Line Service [ROS]. The template is also available through ROS for ROS filers. Payroll Software providers also provide a Revenue approved template. Using the template on ROS, you should print the P60’s on your own blank stationery. You can then handwrite the employee details if you so wish. 19. Where do I get ROS and paper P45’s? P45s can be obtained from Forms and Leaflets @ 1890 306706 or by emailing custform@revenue.ie. The employer’s registration number should always be quoted. 20. If an employee left before the end of the tax year should I give him/her a P60? 21. If an employee commenced with me during the tax year do I include PAYE/PRSI details from his previous employment on my P35? No. Only details relating to the person’s employment with you should be included on your P35 Return. 22. If an employee was with me for two separate periods or more during the tax year do I make two separate entries on the P35 or do I combine the two details into one entry? If you had an employee for more than one period during the tax year, combine the details for all periods and enter the aggregate for all periods under each heading on the P35L. 23. If I have an employee with a PPS number (formerly RSI number) who is not listed on the P35L what do I do? Any employee not listed on the P35L should be entered on a blank line on the P35L giving the required details for the tax year. 24. If I hold a PAYE exclusion order certificate for an employee do I include him/her on my P35? Yes. From the 2011 tax year onwords you should return all employee’s who hold an exclusion order certificate on the P35L. Please tick the relevant box on the P35L to indicate if an exclusion order applies..
25. When returning my P35 to your office do I enclose copies of the completed P60’s? No. Both copies of the P60 should be given to the employee. 26. When returning my P35 to your office do I enclose my completed Tax Deduction Cards? No; tax deduction cards or other payroll records should be held by the employer for six years after the end of the tax year to which they refer. 27. I am on a Direct Debit for PAYE and PRSI and have an overpayment at the end of the tax year. How do I claim back this overpayment? 28. If an employee had more than two classes of PRSI during the tax year where do I show the extra classes? Up to four classes can be included on the P35 listing and are also available on ROS. 29. If I forward a cheque before the due date without the P35 will I avoid the penalty for late return? No. 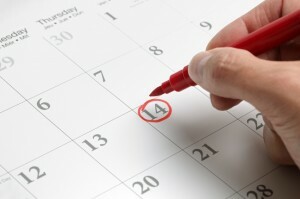 If your return is not received by the due date of 15th February, you risk being penalised. 30. What is “Gross Pay”/”Net Pay”? ‘Gross Pay’ is total pay before any deductions and includes all wages, salaries, bonuses, overtime, commission, holiday pay, etc. ‘Net Pay’ is Gross Pay less any ordinary superannuation contributions made by the employee which are allowable for income tax purposes (i.e. to a fund or scheme which has been approved by the Revenue Commissioners) and which are deducted from pay by the employer. PAYE must be operated on the total net pay. 31. If I made a mistake on my original P35, which has already been submitted to your office, how can I rectify that mistake now? Mistakes on the original P35 Return or updated details can be corrected on a Supplementary/Amended P35 Form. A supplementary return applies where an employee was omitted from the original P35 return already returned. Supplementary returns should be returned to Office of the Collector General Employers P35 File Area, PO Box 354 Freepost, Limerick. An amended P35 return is used where the employer wishes to change the details relating to an employee/s already returned. Amended returns should be returned to P35 Amendment Section, Collector General, C/o Sarsfield House, Limerick. The form can be obtained by contacting the Employers Call Centre at 1890 254565. International Callers should contact + 353 67 63400 or by e-mailing P35helpline@revenue.ie. ROS filers can submit amended or additional details on-line but the employer/agent should wait for a receipt for their original P35 return in their ROS inbox before attempting to file the amended/supplementary P35. 32. If my Employer Number changed during the tax year what should I do? If your employer number changed during the year then the pay, tax and PRSI details up to the changeover date should be returned under the old employer registration number and the pay, tax and PRSI details for the remainder of the tax year should be returned under the new registration number. A separate completed return including P35 Declaration must be made in respect of each Registration Number. 33. If I did not receive a Tax Deduction Card for one of my employees, how can I obtain one? Revenue are no longer providing paper Tax Deduction Cards to employers. The electronic TDC is an improved system that replaces the paper Tax Deduction Card (TDC) that previously issued to some employers. The TDC can be printed or saved locally on your PC for safe storage. You can download the Electronic Tax Deduction Card from the Business & Self Assesment section of the website. 34. How do I join the Direct Debit scheme/change my monthly Direct Debit? 35. If my P35 is ready for submission but I don’t have the payment to accompany it? If it is near the due date i.e. 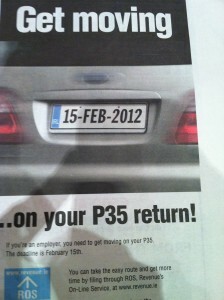 15 February, file your P35 return straight away. If you are experiencing cash flow difficulties and you wish to set up an instalment arrangement you should contact Customer Service, Collector General, Sarsfield House, Limerick at 1890 20 30 70. 36. If I require further P35 stationery who should I contact? 37. How can I change my mailing address if I have to? 38. If I take on an employee without a PPS. No. whom should he/she contact? He/she should contact their local DSFA office where they reside.